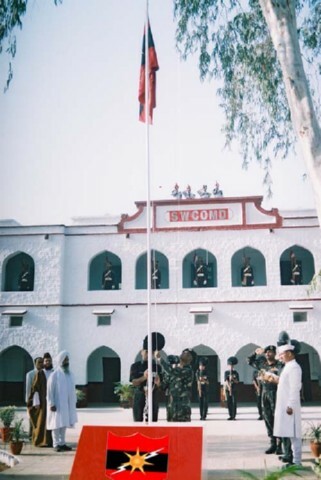 The South Western Command was formally raised on 15 April 2005 and Operationalised on 15 August 2005 at ‘Gothic Lines’ at Jaipur Military Station, with the customary Raising Ceremony and hoisting of the Command Flag by the General Officer Commanding-in-Chief. 1 Corps, popularly known as “STRIKE ONE” was raised in May 1965 at Varanasi under the stewardship of Lt Gen PO Dunn, MC. Raised to be the ultimate instrument of decision to achieve decisive victory, it has sounded the trumpet on several occasions, raising a clarion call to arms. The formation moved to Jhansi in May 65 before moving into the historic city of Mathura in Aug 1965. On 19 Aug 1965 the COAS assigned Strike 1 – the only Strategic Strike Force – the task to launch an offensive in Sialkot sector. The ensuing battles of Maharajke, Phillora & Bhogawal heralded the arrival of Strike 1 with baptism by fire. During 1971 operations, the formation was tasked both for offensive and defensive operations in the Shakargarh sector. A number of epic battles were fought, out of which battle of Basantar will be remembered for its ferocity and the spectacular success achieved with the deepest penetration on the Western front. The results achieved in the battlefield vindicated the politico – military decision of creating a strike force of decision and its importance in a high intensity, short duration war. With a rich history, laurels of numerous battles, many an awards including three Param Veer Chakras and sixteen Maha Veer Chakras the formation today stands as the ‘Ultimate Force of Decision’. Trained, Equipped and Motivated, STRIKE ONERS are known to be ever ready to lead the nations charge into enemy’s belly. The erstwhile British 10 Corps was raised in September 1942 in North Africa to spearhead the offensive operations of the 8th Army. 18 and 10 Armd Div and 10 New Zealand Infantry Division Formed part of this formation. Subsequently, the Corps took Part in the Italian Campaign during 1943-44. In 1944 the Corps was assigned the task to quell the civil war in Greece. In Apr 1945, the Corps was reorganized into independent brigade groups and in May, the same year took part in the final assault of the Po valley. 4 Infantry Division was the only Indian formation which formed part of the order of battle of 10 Corps during the operations against the Mareth Line Defs. 10 Corps was re-raised. On re-raising, the corps adopted the present formation sign which was designed by Lt Gen ML Tuli. The design of the formation sign (CHETAK) of 10 Corps portrays a horse with the torso of a man. The horse with its association with Rajput chivalry is symbolic of mobility and manoeuvre and is shown poised in a bid to spring into action. The torso depicted in a power packed stance of a soldier, launching a spear at the enemy. Taken together, the formation sign depicts instant alertness for aggressive action to face any challenge. The character of this amalgam is symbolic of the optimum readiness of the formation towards the performance of its allotted role.